We provide you with the means of affordably building the perfect home for you. 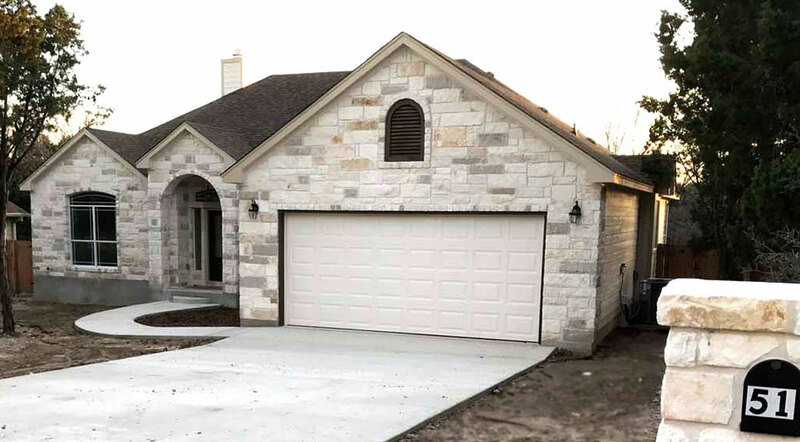 While we are fully equipped to build any size of home, based on customized floor plans and with any number of custom design elements, we primarily focus on 1700 to 3500 square feet Hill country style custom homes that are affordable but are not limited to this. We can build on your lot or you can choose from our inventory of lots available. You can choose from existing floor plans or you can work with an architect to design your own floor plan. You can stay within our standard building and design features – which are generally high standards – or you can choose to modify any of the materials, equipment, appliances or design features that you would like in building your new home. A variety of cabinet styles and colors, and much more. All that needs to be done is to finalize your lot, select your floor plan, choose your design features, materials and every exquisite detail and we will build your ideal home! With a huge array of options in design and construction, we work closely together with you every step of the way to build your home exactly the way you want it. And throughout this process we’ll keep track of all color and design selections and compile these in a handbook for you that contains all of those selections as well as manuals for all appliances and equipment. Everything is documented so you can have peace of mind that you will have all of the information you need to be able to maintain your household for years to come. We are a small family owned business and our priority is personalized service and high quality building practices. Let’s build your home exactly the way you want it! Workman Development are members of the New Braunfels Home Builder’s Association & also the National Association of Home Builders.